Why are some people in sales able to attract endless clients, pitch masterfully in high stakes environments, and consistently close million dollar deals, while still others can’t seem to get out of their own way? There’s something different about masters of the sales discipline. It is a magnetizing, graceful quality that is hard to put your finger on. However, once you see it, it will forever change the way you look at sales and the world around you. Think about the most successful people in history: Michael Jordan on the basketball court, Thomas Edison in the lab, Oprah Winfrey on the TV screen. What do they have in common? The best sales performers in the world—just like the most successful people in every vocation—have Swagger! For almost three decades, many of the most iconic companies in Banking, Finance, Real Estate, Insurance, Energy, Technology and Pharmaceuticals have paid Joe Gianni and his team at 2logical millions of dollars to discreetly teach their sales organizations the magical formula for developing Swagger in their people. Embedded in these pages is the exact path to the top you have been looking for. This is an entertaining and enlightening message that will reveal to you what has been inside you all along: the potential to become the best! Joe Gianni is an entrepreneur, author, executive coach and President & CEO of 2logical, Inc.—a world renowned sales training and leadership development company. As the pioneer of Motivational Intelligence, Gianni has challenged the status quo of the corporate learning world to look beyond the traditional path of skill/process training and discover the resolve of the human soul to succeed. After decades of discreet work with the most iconic companies in the world; 2logical is peeling back the curtain and publishing our first book. 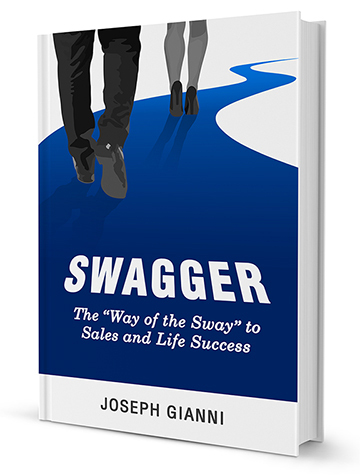 Click here to read the first chapter of Swagger: The “Way of the Sway” to Sales and Life Success. Click here to discover power quotes from the book; content you can start applying to your career immediately.